Best flat iron plate material. Somedays I really want silky, smooth, and especially, straight hair. And the straightforward (pun intended) way to achieve this is with my trusty flat iron. If you have thick, unruly locks, a flat iron is probably an essential tool in your hair care. It makes styling faster and easier. But with so many options available today, deciding on the right one for you when you have to replace that old favorite can be a challenge. So you need knowledge about the types of material used to make the plates – the part that heats up. Choosing the right type of flat iron plate for your hair does not only ensure that you get the result that you want. It also minimises the risk of you damaging your hair. Choosing a flat iron that doesn’t work for you can be an expensive mistake. So, there are 3 main plate materials – ceramic, titanium and tourmaline. Many of the most popular flat irons in the market today have ceramic plates. Aside from its moderate price, ceramic almost always guarantees the desired result of straight hair. However, having 100% ceramic plate is not possible as it is not strong enough alone. Therefore the ceramic is usually mixed with a metal such as aluminum or tourmaline making it tougher and much stronger. Ceramic is a good conductor of heat and ceramic plates heat up quite quickly. Ceramic plates generally distribute and maintain the heat evenly reducing the risk of hot spots which could burn your hair or make it frizzy. They can also be made super smooth. This is really important when you are passing them over your hair. The smoother the plate, the less friction produced and your simply glides through easily. Finer hair strands don’t get caught or drag, meaning you are significantly less prone to damage from hair breakage. Ceramic is an excellent choice for those who have thin and easily manageable hair. But if your hair is on the coarser side (that would be me), you should generally avoid ceramic plate flat irons. While they do get hot and stay hot, they actually don’t heat up enough to work effectively on your hair. To get results, you may have to do several passes which is not healthy for your hair and will actually cause heat damage. Extra tip – when buying a ceramic-plated flat iron, make sure that the ceramic is not just a thin coating as these can tend to peel off. The core material, which is usually aluminum, doesn’t hold the heat as well, and the rougher surface will cause hair damage. 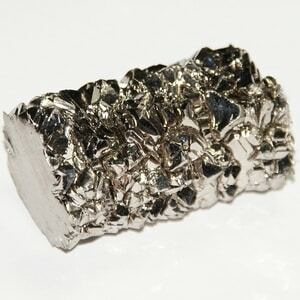 Titanium is a metallic element that is known for its strong heat conductivity property, durability, and light weight. Flat iron plates made of this material are perfect for thick and coarse hair. Similar to ceramic plates, titanium plated flat irons distribute heat evenly and stay that way for a long period of time. However, titanium heats up even quicker than ceramic so they get hot and stay hotter more consistantly. This translates to more better, faster, results for you. Titanium plates can also reach much higher temperature which is required to straighten coarse, frizzy or curly hair. Add the fact that they are super lightweight means that straightening your own hair will be easier. Unfortunately, flat irons with titanium plates tend to cost a lot more than other options. But we think the durability of the plates is well worth it. Titanium plates are scratch-resistant and they can survive being dropped (but we dont recommend this!). So, they can last better, longer so you may even end up saving over buying several cheaper flat irons. Titanium plates are the go-to for professional hair stylists. If you are using them at home, practice caution – the rapid heat transfer rate and potentially higher temperature can damage your hair. To avoid risk of damage, you can opt for one containing a microchip that controls the temperature more precisely, and of course, always use a hair protectant. This semi-precious gemstone is hardly ever used as a plate by itself. Tourmaline is usually crushed into powder and added to ceramic as a coating to make hair shinier, smoother and less frizzy. Tourmaline makes ceramic plates more durable so they don’t chip so easily, and hold the heat better during use. When heated, tourmaline produces up to 20 times more negative ions than any other type of flat iron plate. These negative ions neutralize the positive ions that cause dry and frizzy hair. They also diffuse excess water and lock in the hair’s natural oils, enhancing the hair’s moisture balance and keeping it healthy. In addition, the efficiency of tourmaline at distributing heat through the plates means that these flat irons will straighten hair at lower temperatures than ceramic alone, saving your hair from being fried. Tourmaline is good for any hair type, but especially for those who have damaged hair and need extra care. But if you have a lot of hair, its sadly not idea for you. Indeed, one of the most important things to consider when buying a flat iron is your hair type and style. The different materials used to make the plates ensure that you can find the best flat iron plate for you. While ceramic is reasonably priced, it really only works best for those with thin hair who don’t need much from their flat irons. If this is as far as your budget extends, have a look at our reviews to pick one that we’ve find works well on natural hair. For us girls with thicker hair, the best choice is a flat iron with titanium plates. Heating up to temperatures much higher than ceramic plates, they are guaranteed to work on your hair. They still produce enough negative ions to fight the frizz giving you that silky, smooth and straight hair you desire.